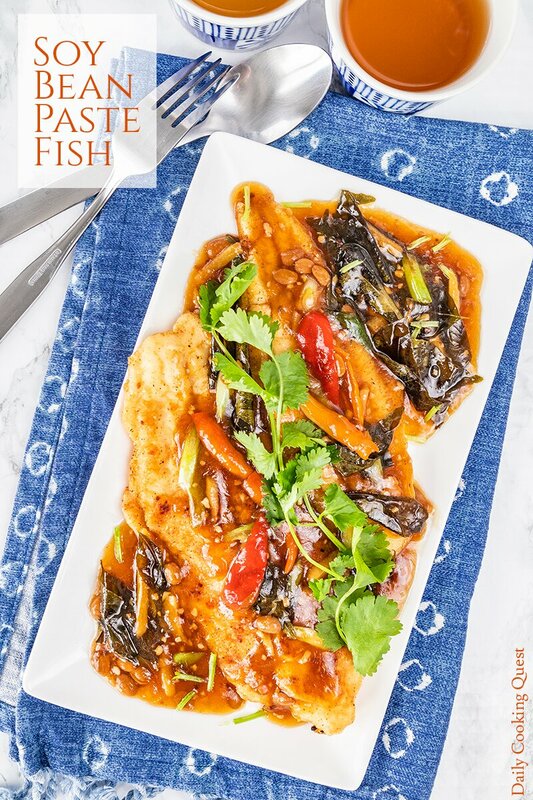 When you want something quick (30 minutes), easy, delicious, and healthy to boot, you may want to give this soy bean paste fish a try. 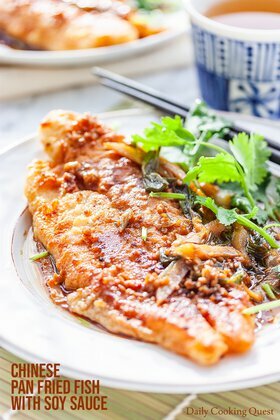 This soy bean paste sauce is one of my favorite sauce, and if you are like me, you will want to pair it with everything, from fried tofu cubes, to something heavier such as bite size fried chicken. 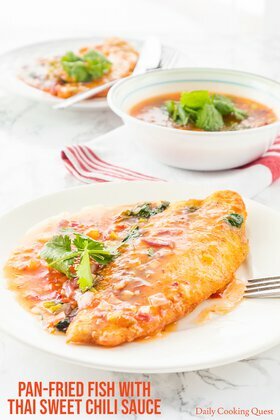 Red snapper, rock fish, swai, cod, grouper, halibut, and tilapia are some of my favorite white fish fillet for pan frying. As long as the fish fillet of your choice has firm flesh, it should be good. If white fish is not your favorite, you can even use salmon or trout fillet. Whichever fish fillet you choose, be sure to pat them dry with paper towel, sprinkle with salt and pepper, and dust with all-purpose flour (or cornstarch for gluten-free option). 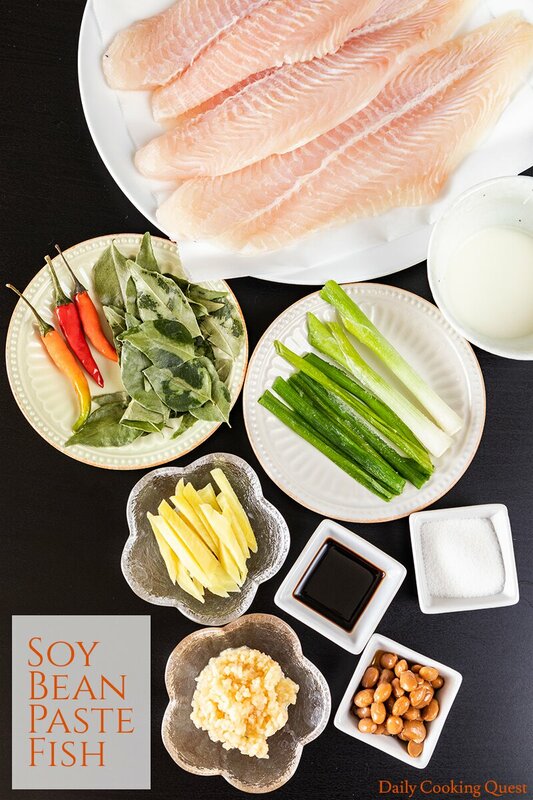 The key ingredient for making soy bean paste fish is salted soy beans. We call this tauco in Indonesia. You can find salted soy beans in most Asian market, and sometimes they are also called fermented soy beans. I typically go either with Yeos salted soy beans, or Dragonfly fermented soy beans. You can use other brands, but try to select the ones with whole soy beans, not the ones with ground soy beans. Another key ingredient is curry leaves. Stores that only sell East Asian (Chinese, Korean, Japanese) and Southeast Asian fares (Indonesian, Singaporea, Malaysian, Thai, Vietnamese, e.t.c.) are usually not a good place for fresh curry leaves. It is better to try Indian or Middle Eastern markets for some fresh curry leaves. I usually buy them in bulk, as in I buy half a gallon worth of zip lock bag of curry leaves, then freeze them. Curry leaves can last for months and months when frozen like this. If fresh curry leaves is not something that is easy to come by, you can substitute with kaffir lime leaves. Originally published on November 19, 2015. Updated on March 4, 2019 with new photos. Pat dry fish with paper towel, sprinkle with salt and pepper, and dust with all purpose flour. Heat oil in a frying pan and pan fry fish fillet until golden brown on both sides, about 3 minutes each side. Set aside in a serving plate. Heat oil in the same frying pan (no need to clean after frying the fish) and sauté garlic, ginger, chili, and curry leaves until fragrant. About 3 minutes. Add soy bean paste, stir for 30 seconds. Season with sugar, soy sauce, and pour the water. Mix well, and bring to a boil. Adjust seasoning as needed. Then thicken the sauce with corn starch solution. Turn off heat, add scallions, mix well. Pour the sauce over the pan fried fish. Serve immediately. 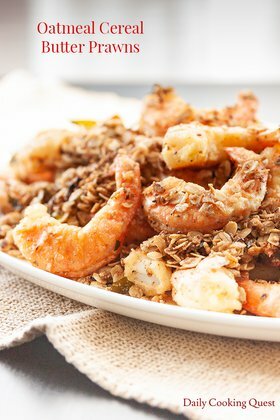 (*) Can be substituted with 6 kaffir lime leaves, but the aroma of the dish will be different. 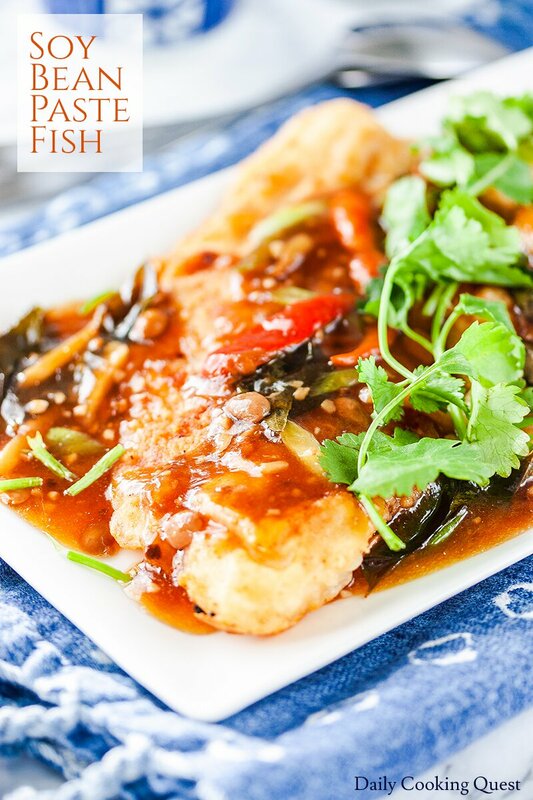 Thank you Anita for your recipe on chinese pan fried fish with soy sauce. I made grouper steak following your recipe and my very "picky" mom gave it the thumbs up. This is one of those rare occasion that she "praised" my cooking. She is 89 years old and has a very poor appetite but thanks to your recipe she ate quiet a bit tonight. What soy bean paste are you using? I only have the Korean one at home, is that the same? Hi Christi, I like using salted soy bean from Yeos, which is popular in Indonesia/Malaysia/Singapore. It is not the same as Korean soy bean paste, but more similar to Chinese ones. Be careful. Tauco (taotjo) is not the same as Chinese salted black beans. The taste is very different.